I’ve spoken freely about my food intolerance and one of the most problematic ones for me is my lactose intolerance. You can’t really have pasta or pizza without cheese, creme brûlée without cream and milk or mushroom soup without cream. I’ve really come to appreciate the different types of cheese you can get in the shops and it’s something I really enjoy adding to my meals. 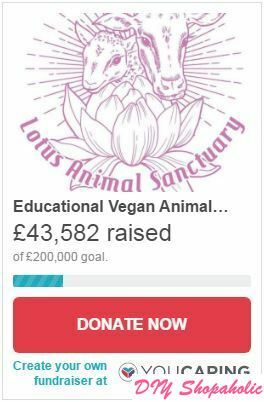 I wasn’t sure what to replace cheese with as a dairy free/vegan alternative…until I discovered the wonder of vegan cheese through The Buddhist Chef. 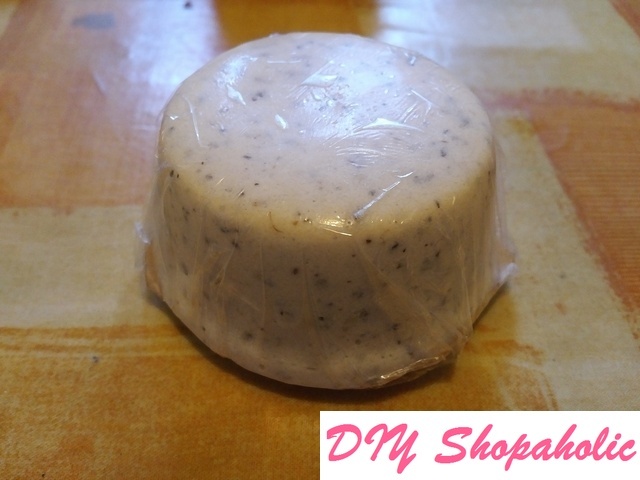 Now, I’m pleased to say that my first attempt at making vegan cheese has been a success and I’m sharing my altered recipe with you. I’ve heard a lot about vegan cheese and how it doesn’t quite taste the same. You can also buy Lactofree cheese in supermarkets, but I’m always a bit dubious about products that claim to be lactose free, but still uses dairy. How does that really taste? 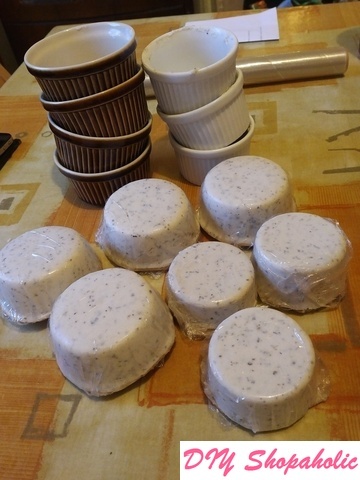 Instead of trying to eat or use ingredients that are altered to remove lactose from a natural ingredient, I decided to try my own hand at making an alternative cheese. A few vegan friends have mentioned making vegan cheese with cashews, but I wasn’t sure how that worked exactly. How does a nut end up having a similar consistency (and taste) to real cheese? While making the vegan cheese, the OH and our flatmate had taste tested the batter and they were very happy with the result and would’ve eaten more of it before I could pour it into the ramekins to set, so I’m taking that as a success on first try! I basically followed the recipe from The Buddhist Chef, but instead of using fresh water, I used the water the cashews were soaked in. Why? 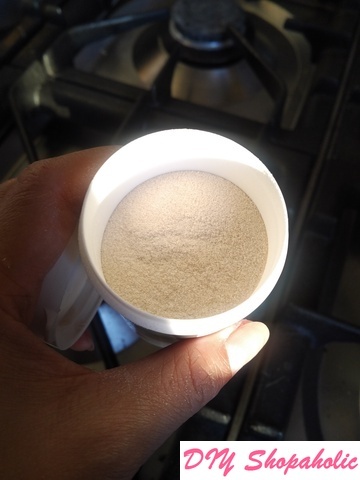 Simply put, the biology of osmosis happens where water is absorbed on one side (ie the cashews), other components (like cashew flavour and nutrients) need to leave the nut to make way for the water. To keep the nutrients and flavour of the cashews in the cheese, I decided to use this water in my recipe rather than using fresh water. 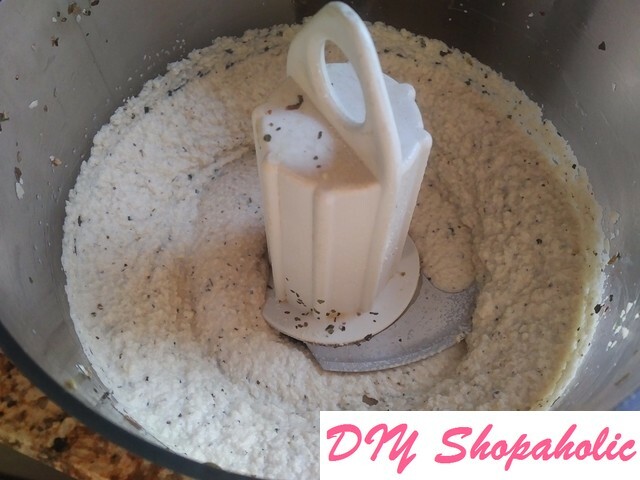 I love garlic and herb cheese so followed this part of the recipe, but you can make a plain cashew cheese without the garlic and herbs or replace this with other ingredients that you prefer. The flavour of your cheese is entirely up to you! It’s a slightly firm cheese (with a jelly-like consistency), but is soft enough to be spread on your favourite crackers or snacks, or eaten on its own! 1. 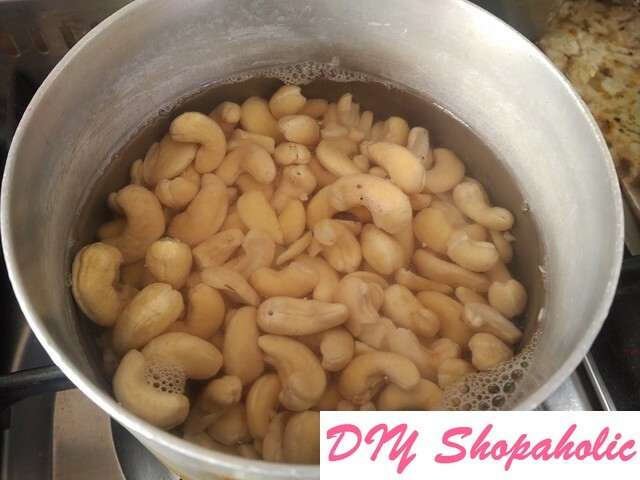 The first thing to do is soak the cashews in hot water for an hour. To make the creamy consistency, the cashews should be soft enough to be blended in with the rest of the ingredients. The hot water will help speed up the process. 2. Next, meausre a cup of the water used to soak the cashews and put it to one side (this will be used later). 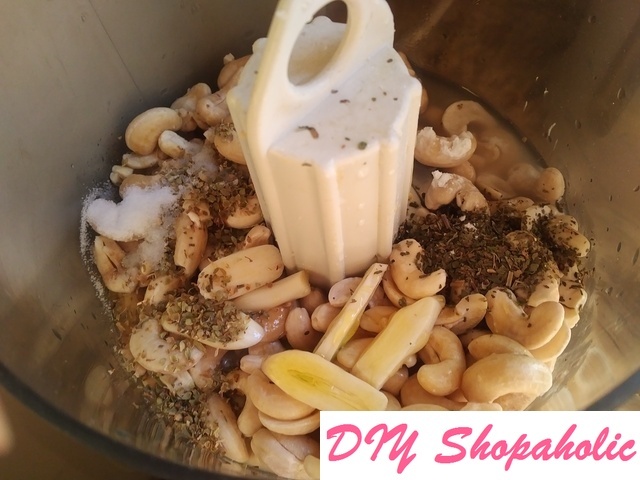 Drain the rest of the water and put the cashews in a blender along with the basil, oregano and garlic (if these are used), salt, cornstarch, nutritional yeast, lemon juice, syrup and slowly add a 1/4 cup of the cashew water. 3. 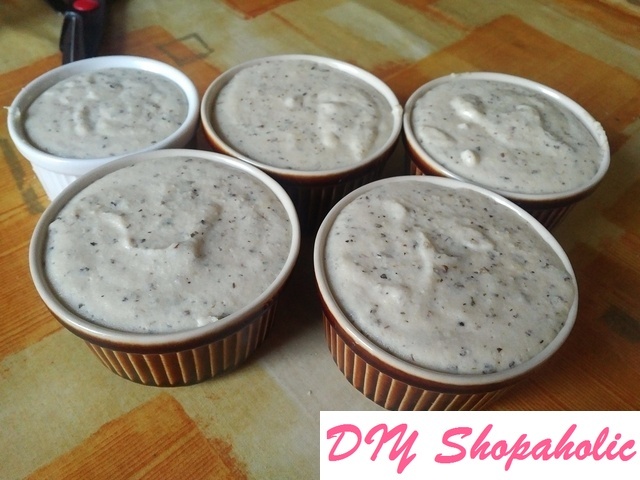 Blend the ingredients together until smooth. At first, the mixture will resemble cottage cheese. The water added is to reduce friction on the cashews and helps blend the ingredients together better. 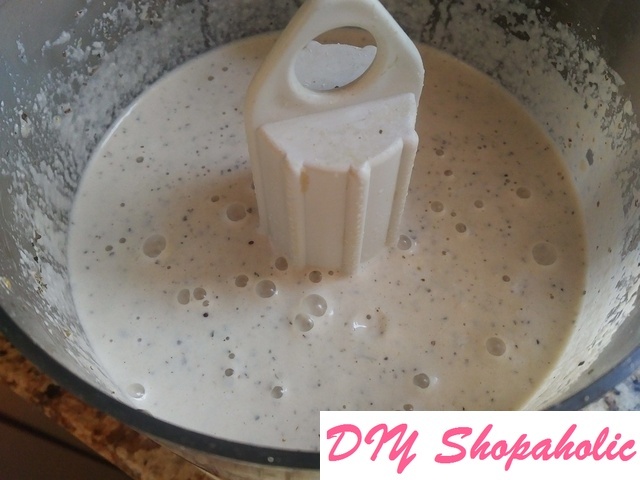 Now add the other 1/4 cup of cashew water to the mix and blend again until you get a cake-batter like consistency, or what is referred to in the original recipe as ‘cashew cream’ – it should basically run like single cream. 4. 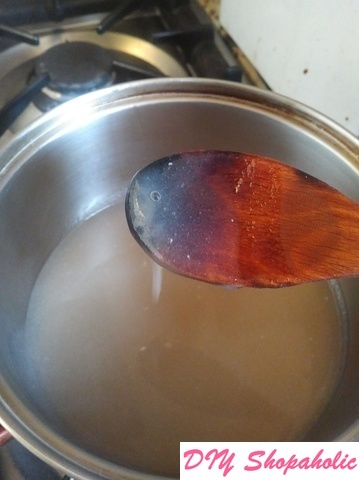 In a saucepan, pour in the other 1/2 cup of cashew water with agar agar powder. 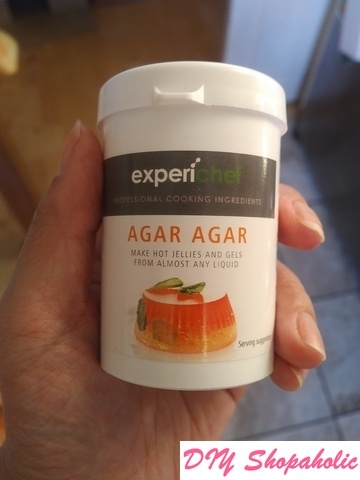 Before using it in this recipe, I had never heard of agar agar powder. 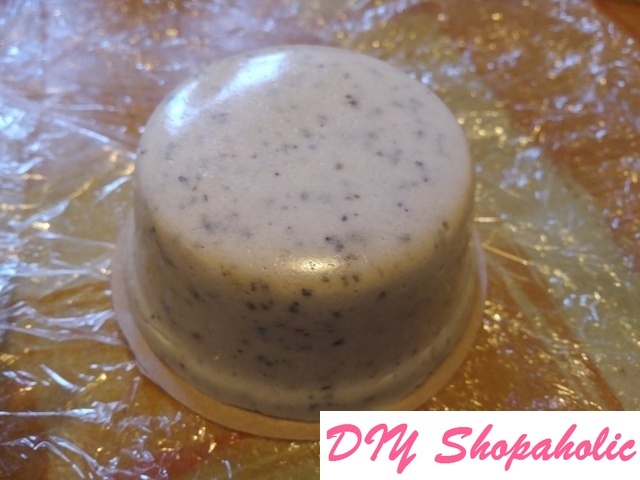 It’s a vegan alternative to gelatine as a setting agent made from powdered seaweed. I got my tub from Lakeland for £4.99. It doesn’t smell of anything really and looks like it could just be gelatine powder if you didn’t know any different. 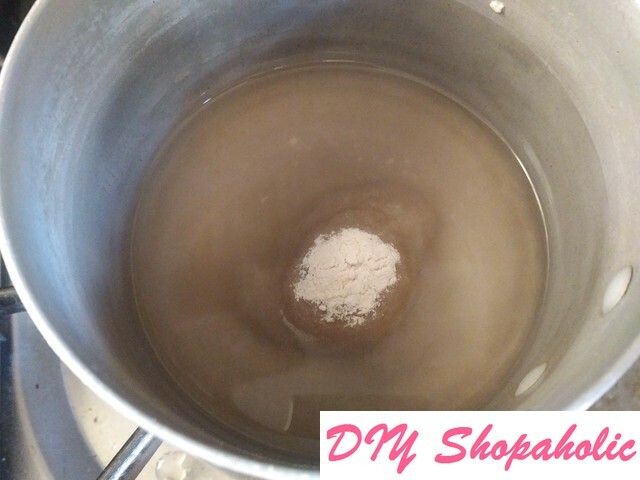 Over low heat, stirring often mix the agar agar powder with water until this is well mixed. 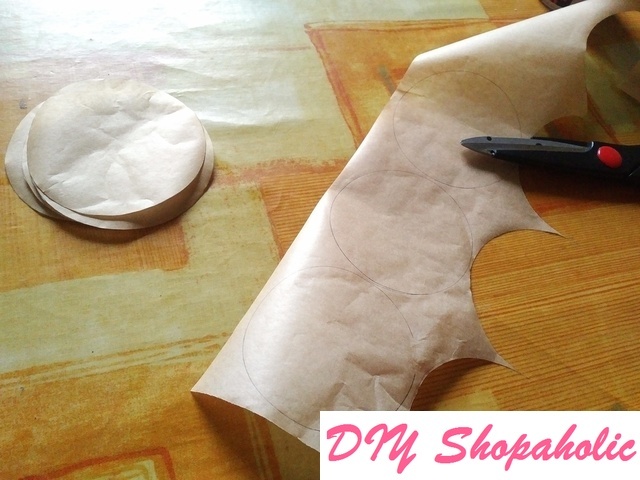 Once it’s ready, it’ll be like a gelatinous paste similar to what you would have used for your papier mâché project in school. 5. Now add the cashew mixture and stir regularly so it doesn’t stick to the bottom of the pan. It should be well mixed on high heat until it starts to boil. Then, remove from the heat. 6. 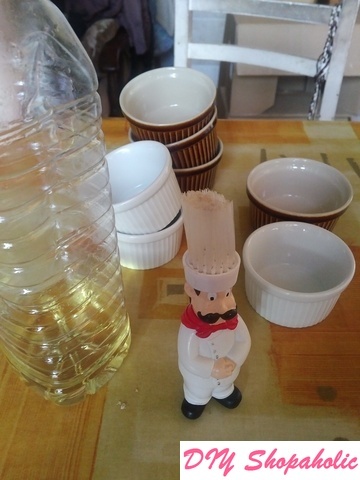 Lightly oil your ramekin dishes. This is to ensure your cheese doesn’t stick to the side when you turn it upside down. I was making a triple batch so I can give some rounds to friends and family so it seems like I’m anticipating an excessive amount! 7. I can be the clumsiest of people, so for safety reasons (for the vegan cheese mix, of course), I poured the mix from the pan into a measuring jug. Then I poured the mix into the ramekin dishes. 8. While it was cooling on the table, the vegan cashew cheese was already starting to set, but to make sure it does set properly, cover each ramekin with cling film (to prevent a skin from forming on the top) and refrigerate for at least 2 hours. 9. Once it’s set (when you shake the ramekin dish, the cheese should be quite solid), turn it upside down on a clean surface. For us, this involved a lot of heavy thumping on the upside-down ramekin before it finally popped out. Some came out easier than others, but do not despair! If you’ve oiled your ramekin it will drop out to give you that smooth surface! 10. To give my cheese a professional look, I used the upside down ramekin dishes to trace baking paper circles and cut these out. This is for the base of the cheese so that when it’s brought out for serving, it has a surface to rest on. 11. 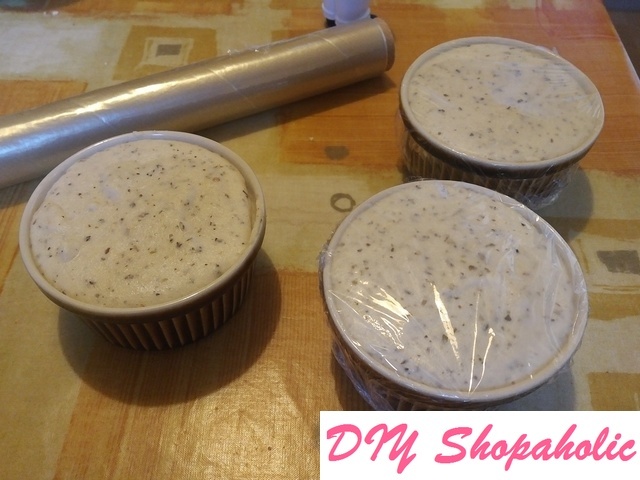 Placing the baking paper to the base of the cheese, I then carefully wrapped the cashew cheese individually in cling film so it can be gifted (or consumed) individually without sticking to the other rounds. If anyone else makes vegan cashew cheese, I would very much like to hear your suggestions on variations of flavours I could try!